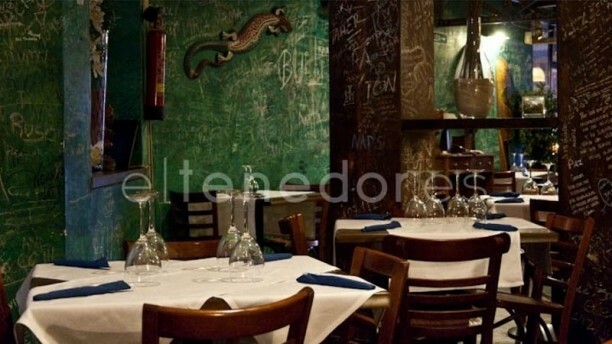 "If you like the exotic flavors of the Caribbean, you can not miss this place in the mythical Fuencarral street in the Malasaña district. Olokun is a charming establishment full of color, with creative decor with tables and walls written on by visitors. It specializes in Cuban cuisine, offering the combinations and flavor characteristic of this cuisine, but with some more current variations: the legendary ropavieja, the Cuban fried rice with yucca chips, zucchini stuffed with enchilada, among others. They have menus of the day at affordable prices and excellent quality, as well as a sampler menu so that you can try different recipes. An ideal place to go with friends to have a good time." Un trato y atencion perfecta !!! Good ambience, friendly and attentive staff, great food! Very good value for money. We will be back!